i couldn't resist taking this one of some sheep in a field on the way back from a home visit today. I took several photos but thought this pair looked particularly appealing. They all seemed to be very interested in me and all looked the same way - I suppose they were "following like sheep"! Nice shot.I think we could use their woolly coats this weekend! Look at those sweet faces. Great shot, Rosie! such warm coats they have ... cute shot, rosie! love their eyes! I like this. With all that wool their heads look almost too small for their bodies. I don't know much about sheep but I was surprised their faces are black but the wool is white. 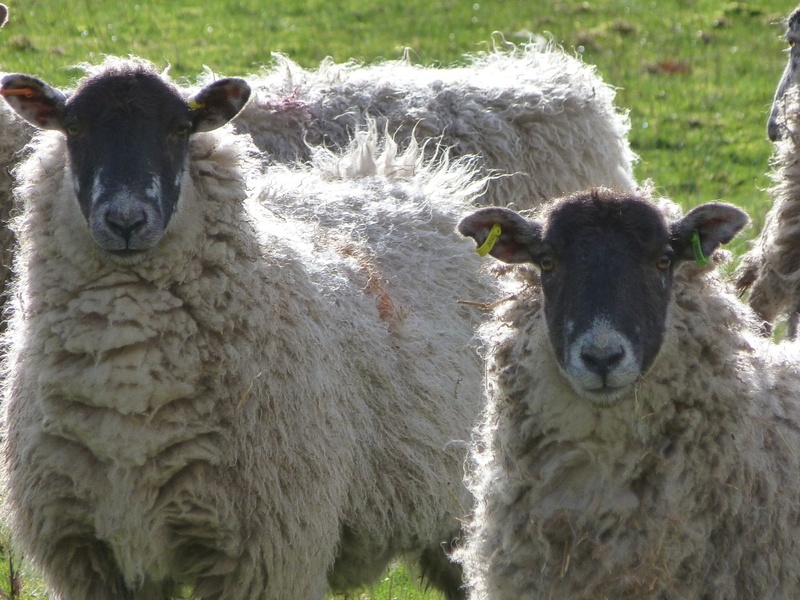 Greyface ewes, very popular crossbreed, & these two want to know what your intentions are; good capture. Nice backlighting. They look as if they're posing! Bah , bah, black sheep have you any wool? Lovely shot...something about how inquisitive they both look. Like their interest! Nice Capture of the ewes. Lovely shot, The title says it all. great eye contact and glowing wool!